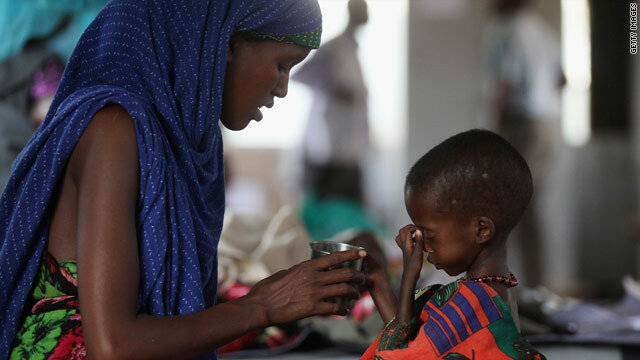 A refugee mother and child in a ward of the Medecins Sans Frontieres Hospital in the Dadaab refugee settlement on July 22. He says Americans will respond generously despite hard times in the U.S. Images of Ethiopia's leafy vegetation may not match everyone's idea of a drought, but millions in the country are going hungry. A campaign to raise funds has galvanized the nation, as families battle a devastating drought. The U.N. World Food Program's executive director says ending chronic hunger is within our power. As the Horn of Africa struggles to deal with drought, rising food prices are adding to growing hunger in Kenya. Doctors are struggling to save lives and cope with death at the Dadaab refugee camp. Primary schools providing free lunchtime meals operate as "life-saving centers." What has caused the East Africa crisis? Long-term drought, conflict, poor harvests and rising food and fuel prices have combined to create a growing crisis. Aid organizations are mobilizing and there are ways you can help.